Mallika Sarabhai is one of India’s leading choreographers and dancers. Mallika has won many accolades during her long career, the – Golden Star Award being one of them, which she won for the Best Dance Soloist, at Theatre De Champs Elysees, Paris in1977. The multi-faceted Mallika holds an MBA from IIM Ahmedabad ( India’s most prestigious business school) and a Ph.D in Organisational Behaviour. She runs her own dance company “Darpana” creating and performing both classical and contemporary works. where and has experience in acting, film-making, editing, and television anchoring. She first made a name for herself in India as a film actress. Always an activist for social change and women’s empowerment, Mallika has been consistently using her work for change. In 1989 she created the first of her hard-hitting solo theatrical works, “Shakti: The Power of Women.” Since then Mallika has created and produced numerous stage productions which have raised awareness, highlighted crucial issues and advocated change. Her theatre group, Darpana has launched several successful projects to spread social awareness and empowerment through the media of performing arts. Several of these are funded by national and international agencies. 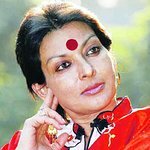 In 1992, Dr. Mallika Sarabhai founded the Centre for Non-Violence through the Arts, which encourages artists from all fields of literature, the performing and visual arts to come together and share thoughts and ideas about non-violence, and to express themselves on the issue through their individual form of artistic creation. Her organization, Darpana also hosts a Festival of Non-violence Through the Arts which commences on Mahatma Gandhi’s death anniversary (January 30), every year. The organisation’s Darpana Communications produces audio and video material, CDs, VCDs and CD Roms for sale, education or for broadcast. The unit specializes in using innovative television to talk of issues of development, the environment, women’s rights, human rights, corruption, corporate responsibility, governance and much else. Her project “Unsuni” is a movement to encourage volunteerism in India. This is done through a website which urges and facilitates individuals to offer their time and specific skills for numerous worthy causes. Google trends for "Mallika Sarabhai"
We don't have any news stories about Mallika Sarabhai. We don't have any videos related to Mallika Sarabhai.